He thinks he”s Australia’s Trump. First mistake: Australia’s government is parliamentary, not presidential. Oh dear. It seems that Morrison totally failed Australian history and believes that Cook circumnavigated Australia! I wonder if this ‘re-enactment’ will include being stranded on the Great Barrier Reef? What do you expect from an advertising man? Pretty much he is delusional. He is very much thinking that he is our Donald trump. Look at his slogans and his style of politics. He is calling himself that. There was no vote. If he thinks Aussies want a Trump, he is seriously delusional. abbott thinks he did a good job as P.M and could do so again - delusion seems to run in the lnp. Palmer is only a living national treasure ... as he instructed his staff to vote for him. He doesn't deserve to be on this list. MORE AMUSING is that our piss weak media runs with it and doesn't fact check. 'Ey mate, there's a drunk roo on the floor. 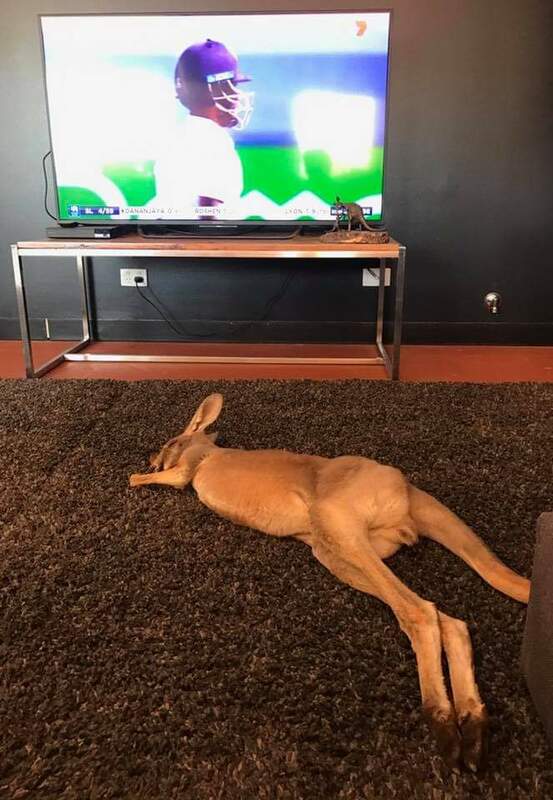 I'm sure there's a comparison between the Australian Cricket team and a sleeping kangaroo. Why is power generation such a complicated cockup in this country? You'd think a nation the size of Australia, surrounded by ocean on all sides maintaining its own electricity production would be a matter of importance to any standing government not just selling everything not nailed down? google is your friend, suggest you start with the word "privatisation". That's what I was referring to... Privatisation hasn't quite been the silver bullet that the pollies tell the public it is. And the worst part of that is, your average person knew privatisation wouldn't end well. It never has. Hope you Victorian and SA peeps are keepin' chill. Our turn tomorrow, apparently. We have a phenomenon in Sydney/Central Coast/Newcastle. On certain days, that have been hot and still, in the later afternoon or early evening, a fresh, strong breeze comes roaring through and breaks the temperature. It's called a Southerly Buster. One has just arrived. Temperature dropped from 36 to 24 in about half an hour. Marvellous! Better than air con! teacake and Gavin70 like this. I wouldn't be surprised if he tried pushing reciting the oath in schools. The oath new Australians recite at citizenship ceremonies on Oz Day. Temperature dropped from 36 to 24 in about half an hour. It's 19 today, I had to put a jumper on. After 39 y'day morning.